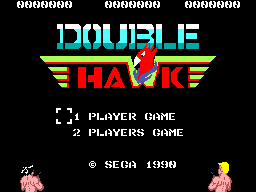 Double Hawk is a third-person shooting game for the Sega Master System. It follows the story of John and Jack, two commandos (who for reason don't wear anything above their waists) attempt to bring down a terrorist organization. Of the two, John has a striking resemblance to John Rambo, a character portrayed by Sylvester Stallone. Double Hawk is a rail shooter game which plays very similar to arcade game Cabal. Players must use their crosshairs to eliminate waves of enemies until the enemy bar in the status screen dissappears. Players also supplied with grenades to attack enemies. Each stage is divided into several parts and a boss is waiting at the end of each stage. Game has several power ups. "R" symbol gives you a rapid firing machinegun, while "S" symbol gives you a shotgun with a large crosshair. "B" symbol increases number of grenades you hold. Game supports two-player co-op but with a somewhat unusual design: Whenever a player loses all of his/her lives, he/she starts using other player's lives, which leads to annoyance between players. Names with a * are Opera House staff.